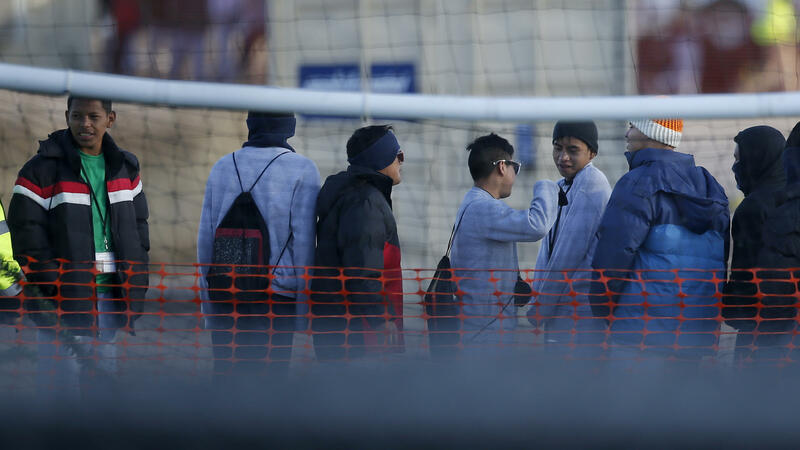 Teen migrants wait in line inside the Tornillo detention camp in Tornillo, Texas, in December 2018. In response to the report, Lee Gelernt, lead attorney and deputy director of the ACLU's Immigrants' Rights Project, said: "This policy was a cruel disaster from the start. This report reaffirms that the government never had a clear picture of how many children it ripped from their parents. We will be back in court over this latest revelation." Today we got a startling report from a government watchdog agency about the administration's policy of separating migrant families at the southern border. The report says many more children were taken from their parents than was previously known. We're going to find out more about this from NPR's John Burnett, who's with us from Austin. Hi, John. SHAPIRO: You've been covering the separation of immigrant children from their parents from the beginning. What is new in this report? Is it just the numbers? BURNETT: Well, it's sort of a bombshell, but the numbers are really important. This report - it's the first time federal officials have acknowledged the government was using family separation to deter illegal immigration nearly a year before they made the policy official. Immigration agents separated thousands more children than we were aware of. The report is from the Office of Inspector General of the Department of Health and Human Services, which is responsible for caring for these kids. Everybody's been focused on this group of about 2,700 kids who were separated from their parents beginning in May of last year. That was the subject of a lawsuit that eventually forced the administration to reunite the families. And I and a lot of journalists had been reporting that immigration agents had been separating families before last May. Today they confirmed it, and the numbers are far greater than anybody imagined. SHAPIRO: The administration described this as a zero tolerance policy at the border. Give us some background, or remind us what went into that policy. BURNETT: Right. Well, in May of last year, remember; Attorney General Jeff Sessions announced the government would observe this zero tolerance policy for all immigrant families who cross the border without papers. And the way it worked was the parent was prosecuted for illegal entry, and then their child, even if they were a baby, was separated and put into U.S. custody. Then we started hearing reports of these wrenching scenes inside Border Patrol holding cells - agents physically removing the child, sometimes the parent and the infant weeping hysterically. So for the three months that zero tolerance was in effect from May to June, we know the government detained 2,700 kids. But as the inspector general told us this morning, this number doesn't represent the full scope of family separations. Here's Ann Maxwell on a teleconference with reporters. She's assistant inspector general at Health and Human Services. ANN MAXWELL: The OIG found that more children over a longer period of time were separated by immigration authorities and referred to HHS for care than is commonly discussed in the public debate. How many more children were separated is unknown. BURNETT: What boggles belief, Ari, is that HHS didn't - can't say exactly how many kids were put in their care before zero tolerance. They said they estimated thousands. SHAPIRO: Well, and then the question is, what happened to these thousands of migrant kids who were separated from their parents? BURNETT: Right. Almost all the minors before and after zero tolerance have been reunited with their parents or released to relatives already living in the U.S - certainly not all but most. And they can stay with these sponsors while they wait to see an immigration judge. SHAPIRO: Tell us about the reaction that we've seen to this today. BURNETT: Well, Homeland Security, whose agents were separating the families, has been on the defensive. A spokesperson repeated what they've been saying all along. They had to remove the children because their parents were facing criminal charges, and you couldn't jail them together. And they say that's always been the case even before zero tolerance. But immigrant defenders are saying the government lied to them about how early the family separation policy was launched - way before zero tolerance. This is Nan Schivone. She's legal director for a group that helps immigrants called Justice in Motion. NAN SCHIVONE: I'm not surprised at all. Members of our human rights defender network in Guatemala started learning about separations at the southern border in early 2018. Families were receiving frantic phone calls from children who were detained and said they didn't know where their fathers were. BURNETT: And I should add that now the Democrats are in control of the U.S. House, with this OIG report, we may be seeing hearings on Trump's family separation policy. SHAPIRO: NPR's John Burnett speaking with us from Austin, Texas - thank you, John. BURNETT: You bet, Ari. Transcript provided by NPR, Copyright NPR.